These are exciting times for fans of the MX-5 Miata, the 2019 refresh will bring a nice power boost to an already excellent car. However, if having those extra ponies isn’t all that important and you want to keep some serious cash in your pocket, now is the time to get a 2018 with a huge discount. Our friends at CarsDirect.com got access to some regional dealer bulletins that revealed some incredible savings, but only if you live in areas with abundant sunshine. Update 9 p.m.: MazdaUSA’s website was recently updated and the customer cash rebates cannot be combined with the zero percent APR financing. The rest of the article continues as it was below. On July 27, dealer bulletins show shoppers in Gulf States like Texas became eligible for $3,500 customer cash on all Miata soft tops through September 4. Mazda owners can get a $500 loyalty bonus for $4,000 in combined savings. 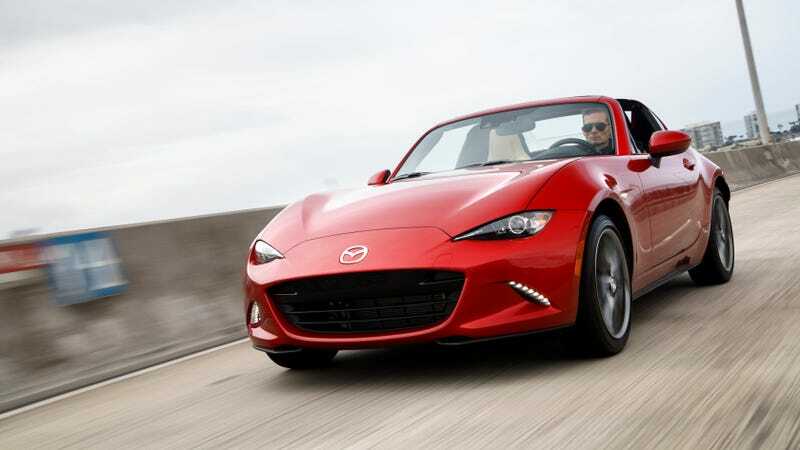 In California, Mazda is offering $4,000 bonus cash on both the soft tops and hard top RF through July 31. This is worth 8 times more than the paltry $500 from earlier this month. With the loyalty offer, that’s $4,500 in savings. Here, the $4,000 actually goes a bit farther because of how it’s classified. Since it’s a bonus, you can actually stack it with special financing rates. At the moment, that’s 0.9% APR for up to 72 months. Up to $4500 off the sticker price, before any additional dealer discounts combined with low APR financing for up 72 months is a steal. But here is the catch—you have to be a resident within those areas to get the big savings. ...offers can vary by region and have residency restrictions. For example, only soft tops are eligible for the larger rebate in cities like Houston, while the incentives are equally good on the soft top and hardtop in Los Angeles. So for those of you that don’t live in the areas that are subject to these large rebates, but want to take advantage of the savings you may be thinking, “I’ll just buy my Miata from Texas or California and ship it.” Unfortunately, the rebates follow the customer’s area of registration, not the location of the sale. Of course, if you qualify for these rebates the question becomes is the 2019 Miata several thousand dollars better than the 2018 car? That is up to you to decide. The MX-5 offer in the Western Region is actually available until 8/31 vs. 7/31 that was published. Additionally, the offer in the Western Region does not have any residency restrictions, meaning should a customer outside of the WER states wish to purchase the vehicle, they are eligible to do so. The offer is actually available in all of the states in the Western Region (CA, AZ, NV, UT, OR, WA, ID, MT, HI, AK) vs. just the mentioned California.